Along the way we’ll share the history, contributors, and tools often used in creating an information architecture. Even if you’re familiar with the discipline already, you can probably pick up something you’ve missed. Information architecture is a more difficult field to define than many others. Unlike content strategy, which is accomplished by content strategists, or interaction design, which is accomplished by designers, information architect is very infrequently a job title. It is, however, a valuable and necessary field which crosses multiple roles. In other words, information architecture is the creation of a structure for a website, application, or other project, that allows us to understand where we are as users, and where the information we want is in relation to our position. 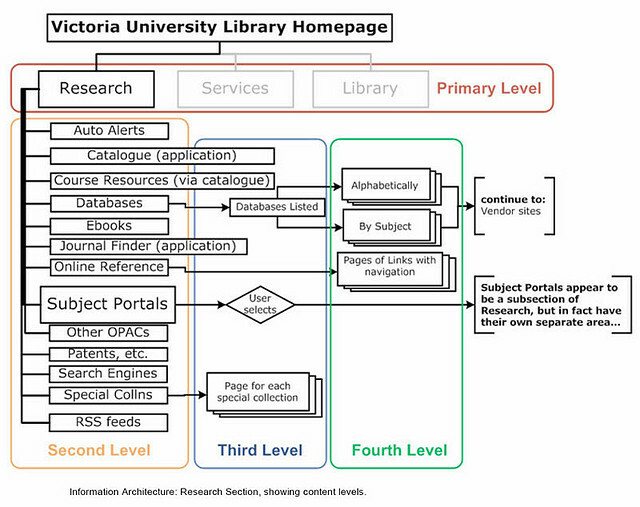 Information architecture results in the creation of site maps, hierarchies, categorizations, navigation, and metadata. When a content strategist begins separating content and dividing it into categories, she is practicing information architecture. When a designer sketches a top level menu to help users understand where they are on a site, he is also practicing information architecture. What is the flow of users through our site? How does the application help the user catalog their information? How is that information presented back to the user? Is that information helping the customer, and driving decisions? To answer these questions, the information architect must focus on a number of things: the target audience, the technologies related to the website, and the data that will be presented through the website. Library science has many definitions, but one that seems particularly clear is from the University of Washington’s description. They define library science as the development of “knowledge-organization systems.” Library science is the study of how to categorize, catalogue, and locate resources. It is used everywhere from traditional libraries to museums, science labs, and hospitals. Two particularly valuable areas of library science for information architects are the art of cataloguing, and archival science. Cataloguing is the process of creating metadata and assigning it to content in order to find it again in the future. Archival science is the process of building and curating archives filled with content, which may need to be edited or removed in the future in order to maintain the integrity of the archives. Both elements are directly translatable to user experience work, where our goal is to create an information architecture that has appropriate and usable metadata, with content available in a well-maintained archive. In our Complete Beginner’s Guide to Interaction Design, we also referenced cognitive psychology as a common methodology. Cognitive psychology is the study of how the mind works, and what mental processes take place there, so it’s not surprising that it influences both the interactions we design and the way we architect information. Cognitive load is the amount of information that a person can process at any given time. Keeping in mind the user’s cognitive load helps prevent information architects from inadvertently overloading a user with too much information all at once. Mental models are the assumptions people carry in their minds before interacting with a website or application. Information is easier to discover when it is in a place that matches the user’s mental model of where it should be. Decision making may not sound like psychology, but it is! It’s a cognitive process that allows us to make a choice or select an option. Information architects can help us make decisions by providing certain information at key moments. Much like architecture, information architecture can take many attractive forms, and is based on a precise, intentional structure and solid foundation of ideas, though IA features in everything from libraries to websites. An information architect will generally do a variety of activities as part of a UX project team. Common tasks include research, navigation creation, wireframing, labeling, and data modeling. Most of these tasks are valuable because of the process they follow, and some also result in deliverables, which we’ve referenced where relevant. IAs take on myriad responsibilities for a project. To learn about the project’s audiences, IAs need access to the results of usability tests, card sorting exercises, stakeholder interviews, and user interviews, just to name a few. Often, an information architect will take an active role in facilitating interviews or card sorts, where they can see how a prospective user would categorize a variety of terms. Through this research, information architects are able to learn what people will do with an application, how people will use information provided by the application, and what mental models the users have when they use the application. After conducting this research, an IA will begin to analyze the data. They may present the information to the rest of the team as a spreadsheet or a set of recommendations, or even as a set of user personas that will showcase who the typical user is, what their goals are, and how they might approach the application. The information architect is the key person responsible for determining how information across a website or application is displayed and accessed. As we’ve discussed, this is the key piece of information architecture. In order to create this hierarchy, the IA needs to consider what the user expects to see, as well as what content the organization wants to connect. For example, if an organization wants users to associate their FAQ with their Help page, they might put both under the Support section. However, they might have determined during research that users expect an FAQ to live under a Product section. This is a decision the IA needs to make. There are benefits to both, and the IA may also be able to consider alternatives that will achieve both goals, such as putting both the FAQ and the Help page under the Product section. Ultimately, it’s these sorts of decisions that create the structure for the rest of the site or application. The deliverable that is most commonly associated with this work is a site map, which illustrates the hierarchy of content across a website. For some information architects, wireframes are the best way to represent the connections between different screens and identify how the site will work from a practical perspective. Based on the information gathered during research and the decisions made during hierarchy creation, an IA will sketch out certain key screens in order to demonstrate how a user will interact with the information available. This is particularly likely to happen when the designer is the one responsible for doing the information architecture work. Since designers tend to think visually, it makes sense for the designer to use wireframes to demonstrate the hierarchy of information. Wireframes are also a valuable deliverable to share with clients, and for developers and visual designers to reference as they build mockups, prototypes, and final products. We mentioned earlier the importance of making decisions as to where information lives. Once an IA makes that decision, they also need to decide what the section might be called. While this may fall into a content strategist’s purview, it’s a decision that every IA should weigh in on, whether the IA is also the content strategist, or a designer. Labeling, or what we call pages and links on a site, ensures that our navigation and hierarchy is appropriately titled, which plays a large role in whether users will be able to find that information. A taxonomy is a set of things that are grouped together. For an information architect, taxonomies are also records of how we group similar types of content or pieces of information. Most IAs will choose one or more appropriate taxonomies for a website or app based on the mental model of their target audience. They may then “tag” content with metadata, so that users can search for content based on the assumed taxonomies. For example, a clothing store might consider multiple taxonomies: one based on fabric type, another based on clothing item, and another based on color. The information architect would tag a shirt with cotton, or nylon as well as shirt or top and red. That way, a shopper with the mental model “I need a new shirt” could easily find this red, cotton shirt. Also referred to as content modeling, this work may be shared with a content strategist. Data modeling pairs an IA with developers in order to determine structured content types that represent user needs, business logic and requirements, and internal editorial practices. In the case of website redesigns, new data models will often need to be mapped to existing structures in order to assure a smooth content migration. This kind of work is often done in spreadsheets, mapping out field types and relationship requirements, but it is sometimes implemented directly into a CMS. Data modeling can also result in the creation of documented content types, or content templates, for content strategists or copywriters to use as they create content. Abby Covert, or “Abby the IA” is the author of the book How to Make Sense of Any Mess: Information Architecture for Everybody. She also teaches information architecture at The School of Visual Arts, and General Assembly NYC. Abby is the president of the Information Architecture Institute, where she focuses on empowering IAs around the world. She writes about IA, speaks about IA, and teaches IA while also practicing as an information architect in New York City. Andrea Resmini is an information architect and a teacher and researcher at JIBS. He is the co-author of Pervasive Information Architecture, and conducts IA work at FatDUX, a leading UX firm. He’s currently acting as President of the Information Architecture Institute, chairs the Italian IA Summit, and is a founding member of the European center for user experience. In his spare time Andrea founded and is now an Associate Editor for the Journal of Information Architecture. Christina Wodtke, another co-founder of the Information Architecture Institute, is also an impressive name in information architecture. Her roles have included general manager of Zynga.com at Zynga, general manager of Social at Myspace, principal product manager at Linkedin, and senior director of design at Yahoo!. She is also the cofounder of the collaborative blogging tool PublicSquare, and the design publication Boxes and Arrows. Christina currently advises startups and writes at her blog, Eleganthack. Dan Klyn has been working as an information architect for nearly twenty years in agencies, e-commerce organizations, and non-profits. He also teaches information architecture, at the school of Information at the University of Michigan, and is the co-founder of The Understanding Group (TUG). Dan works with clients around the globe, and speaks at conferences including IA Summit, UX Week, and WebVisions. His four minute talk Explaining Information Architecture is well worth a watch. Donna Spencer is a freelance information architect, mentor, writer and trainer. She is the author of A Practical Guide to Information Architecture, and two other books for user experience practitioners. Donna has 9 years experience working in-house and as a consultant doing strategic and tactical design. She has designed large intranets & websites, e-commerce & search systems, business applications, design patterns and a CMS. Donna is also the co-organizer of UX Australia, which she now runs. Eric Reiss is known for his work as an information-architecture consultant, author, and theorist. His book Practical Information Architecture: A Hands-On Approach to Structuring Successful Websites is one of the quintessential IA books, and his work Usable Usability has changed the way many organizations tackle UX challenges. He is currently the CEO of FatDux, a user experience group in Copenhagen. In 1995, Jesse started working on the Web — first as a writer and interface developer, then as an interface designer and information architect. In 2001, he started the company Adaptive Path, to help people solve user experience problems. Today he writes articles and speaks publicly about User-centered design and Information architecture. He is also the author of The Elements of User Experience. Louis helped create the profession of information architecture, co-authoring its leading text, and was president of its best-known consulting firm, The User Experience Network, for seven years. Lou co-founded the Information Architecture Institute and is a member of its Advisory Board. Nick is a 12-year veteran of the web and considered a web craftsman by trade. His skills traverse web design, web development, user research, web analysis, information architecture, and web publishing. He is the author of numerous web design-related articles for various publications. Peter Morville is one of the founders of information architecture. He is a writer, speaker, and consultant. His bestselling books include Information Architecture for the World Wide Web (also known famously as the “Polar Bear” book) and Intertwingled: Information Changes Everything. His work has been covered by Business Week, The Economist, NPR, and The Wall Street Journal. Information Architecture takes a good deal of mental work, and so some IAs prefer to use nothing but paper and pen. However, ultimately, information architecture results in site map creation, metadata tagging, and categorization—all of which needs to be shared with clients in one visual format or another. Some information architects also create site wireframes, which require additional tools. Here, we’ll review some of the products information architects use to create site maps, define categories, and design wireframes. Omnigraffle is the Omnigroup’s diagramming and wireframing suite. It’s particularly valuable in that wireframes can be set up with a hierarchy, so that users can not only click from one screen to the next, but can also see a sidebar showing how all the pages relate to one another. OmniGroup’s product can do diagrams, process charts, quick page-layouts, website mockups, and more. Once past the initial learning curve, budding information architects should find a lot of value in what Omnigraffle has to offer. Similar to Omnigraffle, Axure is both a wireframing and a diagramming tool, which is very useful for information architects—particularly those who are also interaction designers. Axure’s goal is intended for rapidly creating wireframes and prototypes of websites and applications. MindManager is a visual framework, meant to, in MindJet’s words, “promote freeform thinking and quick organization of ideas.” With MindManager’s easy drag-and-drop functionality, information architects can quickly and easily get ideas out, and then organize those ideas into a site map that illustrates their ideas. MindManager lets IAs export maps as JPGs, PNGs, PDFs, or Word documents. XMind is yet another mapping software, with the added benefit of allowing IAs to save their maps to Evernote. They offer a full library of maps for users to share their finished work or see others’ work. Users can download a free version, or buy XMind pro, and they work on Mac, Windows, or Linux. For information architects looking to test their hierarchy and find out how well users can find information, Treejack is a great tool. Billed as an “information architecture validation software,” Treejack lets IAs input a site hierarchy, set up tasks, and recruit users. Then they can see the results of the unmoderated test, and share or download the results. Information architects can attend conferences, and join a variety of associations and community groups intended to help promote the field and those who work in it. The Information Architecture Institute (IAI) in a non-profit organization, dedicated to promoting the “concept, craft, and community of information architecture.” They offer volunteer opportunities, discussion forums, promotion for local IA groups, and a variety of ways to network and learn from other IAs in the field. 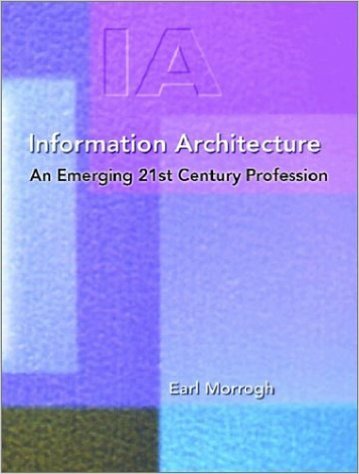 The IAI also puts together World IA Day, and a publication, the Journal of Information Architecture. The Association for Information Science and Technology (ASIS&T) is an association not only for web architects, but also librarians, researchers, developers, and professors and students. Their goal is to close the gap between theory and practice of information science. They run Strategic Planning Town Hall sessions, a journal publication, and events and webinars for their members. The Information Architecture Community Group is an online community hosted by W3C. Members of the community can pose questions or discussion points and engage in conversation with other IAs around the world using the online forum. W3C is very clear that, although they host the community, the opinions and ideas do not necessarily represent their organization. All are welcome to publish and discuss. The IA Summit, held in a different city each year, is a fantastic learning experience for novices and experts alike. 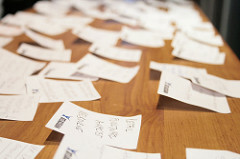 Talks are collected and curated, covering data and content areas of information architecture. In the past few years, IA Summit has also made a point of tackling the new challenges coming to the field as a result of greater digital ecosystems and the Internet of Things. An Event Apart advertises itself as the design conference for more than just designers and developers. “IAs, UX pros, project managers, writer/editors, marketers, and, yes, clients attend as well.” And it’s true. Though AEA offers some sessions too heady for anyone not steeped in HTML and CSS, they offer just as many talks that cross fields and job titles. For information architects learning more about design, or designers learning more about IA, An Event Apart is an event worth attending. To be fair, there is no one Meetup group. That’s the beauty of it: search “information architecture” in your city on the Meetup interface, and you’ll find any number of networking groups, educational groups, and social groups. If you happen to live in an area where an IA meetup doesn’t yet exist, now’s the time to start! As it happens, Meetup’s interface also makes it easy to start a new group. Check out these recommended books for any IA library! Published in 2005, Peter Morville’s book about information overload and finding content in the world of Google is as valid now as it was then. He digs into the question “why does it matter how information is structured, if Google can magically find the answers to your questions?” and connects information architecture to content usability. Donna Spencer’s guide for information architecture is exactly what it says: practical. The book is essentially a checklist for IAs, along with an overview of how IA and UX work together. 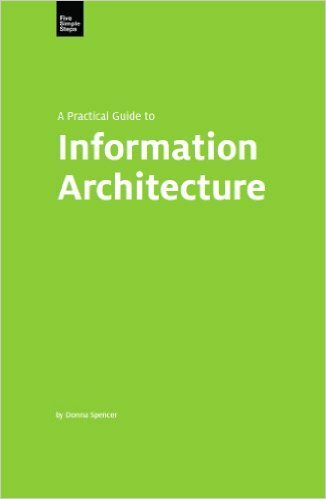 For advanced information architects, this book may be a little too basic, but for anyone looking to get started, this has all the information you need. 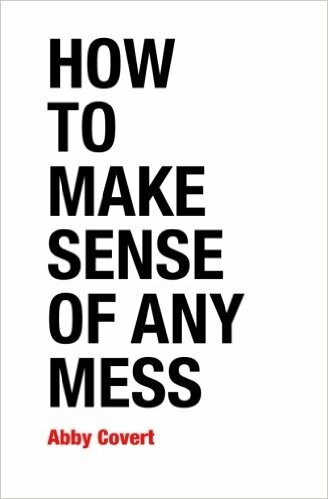 Abby Covert defines the word mess as “A situation where the interactions between people and information are confusing or full of difficulties.” It’s an accurate definition of mess—and also an accurate definition of most sites, before they have an intentional architecture. In this book, readers get a seven-step process for tackling even the messiest hierarchies, to help break the work down and make it manageable. 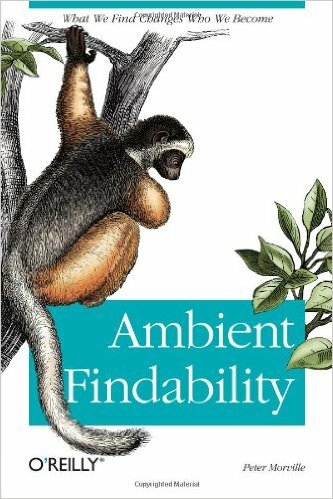 This 2003 book speaks to the multidisciplinary nature of information architecture. It addresses the integration of skills from visual design, information design, library science, information science, and human-computer interaction to accomplish an IA’s work. In the book, which is more of a history than a how-to, Morrogh talks about the purpose of creating information environments that are beautiful, valuable, and easy to use. Now on its fourth edition, Information Architecture for the World Wide Web is one of the foremost books on information architecture. 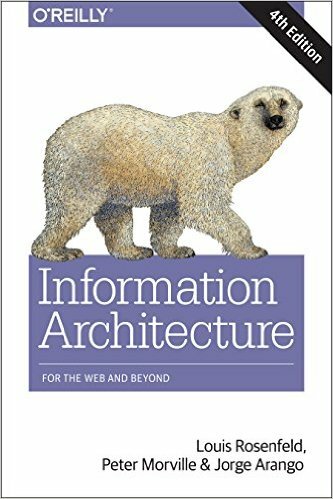 It is so ubiquitous in UX departments and agencies that many people know it only as “the polar bear book,” nicknamed for the polar bear on the cover. The focus of this book is creating IAs for large web sites, which offer more complicated hierarchies.